Photography at Halloween is always a challenge as it all happens after dark and, when it does happen, it usually involves very bright, very fast moving flames or explosions surrounded by intensely dark night scenes. Perhaps unexpectedly, the trick is to work with faster shutter speeds than you would at first imagine. This requires the use of a higher ISO and the largest aperture you can get. The shot above has captured the flames and frozen them (if that’s an appropriate term). You can see the flames as opposed to the results that would have been achieved at a slower shutter speed where the flames would have merged into one long streak of light like a long exposure of moving lights. This shot was taken with an ISO of 1000 and a shutter speed of 1/400. The aperture was f5.0. The highest I could push it to keep as much as possible in focus. This shot had a slower shutter speed of 1/200th. Still a fast shutter speed to be taking pictures at night, but you can see how the flames merge together into one long hot spot and you lose the definition of the individual flames. This shot was taken a little further away and was one of the first shots I took, hence the exposure not being what I finally went for. I was further away at this point because I had no idea how all the fuel we were using to torch light the lantern was going to burn. 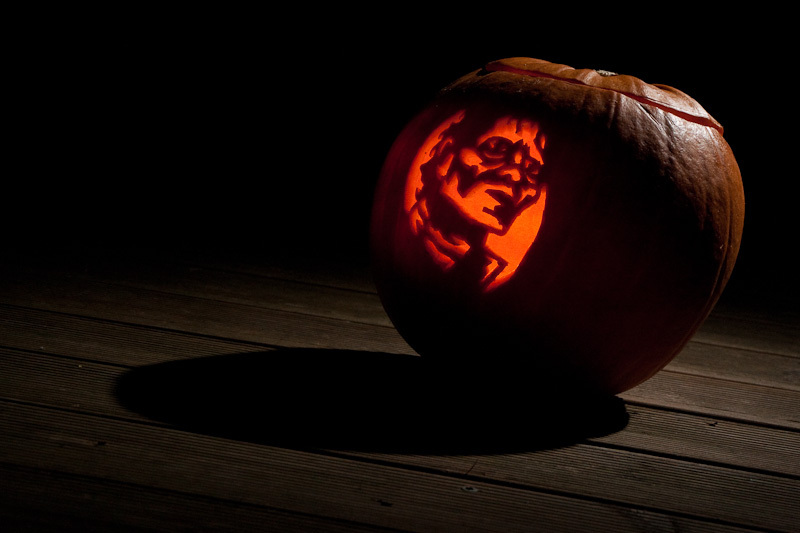 Before we even got to the lighting phase, I had to have shots that were worthy of the effort that had gone into the creation of a Michael Jackson Jacko Lantern pumpkin carving template, and then the amount of time it had taken to actually carve the lantern. 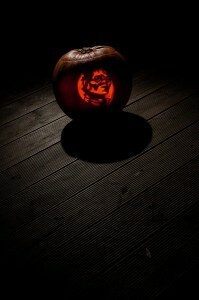 I tried the traditional front on shot, with a night light candle burning inside the carved pumpkin. Shutter speeds should be much longer for this as this time you want to create a glow inside the lantern. I’ve still kept my ISO high, at 1250 so that I can get an aperture of F8.0 for sharpness and a shutter speed of only 1/20th second. Long enough to let the light inside the lantern really glow. 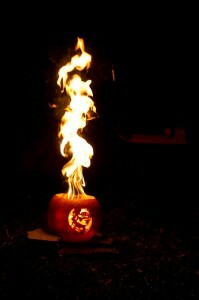 This shot alone didn’t do the carved pumpkin justice as all you could see was the Michael Jackson face. Everything else was completely black and unexposed. My only hope was to get a flash out. I set the flash up behind the pumpkin to back light it and used pocket wizards to trigger it. I added a snoot to the flash to create a pool of light around the pumpkin and chose an angle that meant the top of the pumpkin was above the back of the pool of light, as if the pumpkin were rising above the light pool. All the exposure settings remained the same and I played with the flash strength until I got the required exposure on the back of the pumpkin and on the decking. If you’re interested in how we got the 4 foot high flames from our lanterns, I’ll tell you if you promise not to hold me responsible for any damage that might happen if you are foolish enough to try this yourself. Our trick was to soak and entire toilet roll in a tub of paraffin (or kerosene if you’re from across the pond) for about 20 minutes. 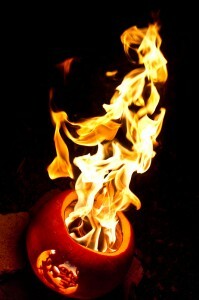 This was then placed in the middle of the pumpkin and the hole in the top of the pumpkin was cut to be wide enough to allow the flames to come out of the top of the pumpkin without overly burning the pumpkin itself. Then you just light it and stand back.